Yes, for a headlight swap, Ford says that the bumper fascia must come off. To hopefully speed things up for you, here's a couple of pictures and information on what you need to know to remove the front bumper fascia and remove your headlight assembly. 1. Pop off the radiator cover with a standard slot head screwdriver, by popping up the heads of the six plastic clips and pull them out of their locating holes. 2. Using a 10 mm socket, remove the the top fascia cover bolts beside the headlight assembly on both sides (see the picture above for bolt locations). 3. 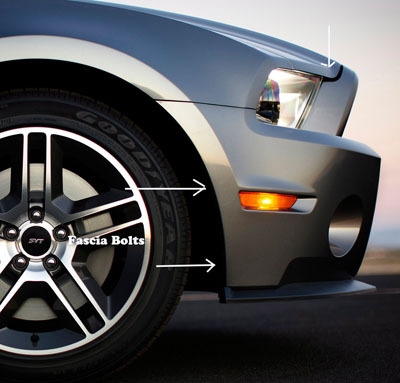 Then turn your wheels to either the right or left and undo the screws on the exposed wheel well locations, that hold the inner fascia/bumper lip to the inner fenders with a Phillips screwdriver. 4. Then underneath, you'll find 7/32 bolts that have to be removed. 5. Also, you'll find two 10 mm bolts where the fascia and body meet underneath the front mud guard. Remove the screws holding the front well cover to the lip. Then tug gently inward and down to release them and expose the bolts. 6. Remove the marker light plugs from the access and repeat the same procedure on the opposite side. 8. 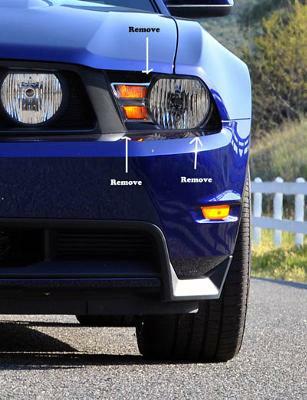 Carefully pull off the bumper/fascia and place it onto a soft surface to prevent scratching your 2010 Mustang's paint. A. Use the 10 mm socket and remove the one bolt at the top and the two on the bottom (see picture above). B. The top plastic bracket acts like a locating clip, so it needs to be lifted up slightly out of it's hole to allow the headlight assembly to come out and forward. C. Remove the headlight clips and your assembly is ready to pop out.